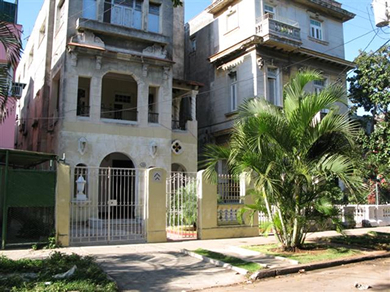 The Vedado neighborhood is located in the center of Havana and is a very nice, lively and authentic part of the city. It is also the center of Havana nightlife and home of the most important hotels such as Nacional, Melia Cohiba and Riviera and of discos and venues where to listen to live music such as Salon Rojo, Turquino, Habana Café, Delirio Habanero and Cabaret Parisien. Excellent location in the center of the Vedado district, the center of Havana nightlife and home to the most important hotels such as the Melia Cohiba and the Riviera. This is also a very authentic part of the city that facilitates the contact with the main attraction of Cuba, its people. 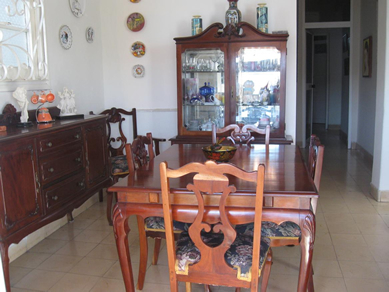 Are available for the guests of this apartment: 2 double bedrooms, 2 bathrooms, living room, kitchen and balcony. It is equipped with air conditioning, refrigerator, TV, DVD and CD. 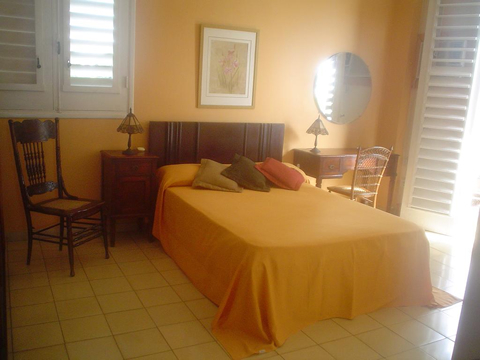 The owner Mrs. Dalia is very nice and friendly and you can ask her any questions about your stay in Cuba.Cleaning, change of sheets and towels three times a week, all utilities and local phone calls are included in the price. Breakfast and meals are offered at cheap prices upon request. Excellent location in the center of the Vedado district, the center of Havana nightlife and home to the most important hotels such as the Melia Cohiba and the Riviera. Are available for the guests of this apartment: 2 double bedrooms, 1 bathroom between the two bedrooms, living room and a fully equipped kitchen. 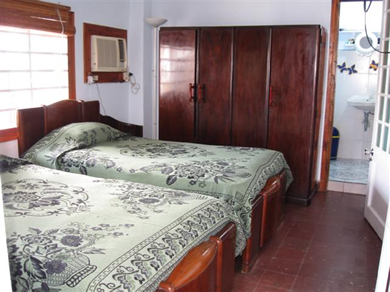 It is located on the ground floor and equipped with air conditioning, refrigerator, TV and CD player. The owners Mrs. Maida and Mr. Diosdado are very nice and friendly and you can ask them any questions about your stay in Cuba. Daily cleaning, all utilities and local phone calls are included in the price. Excellent location in the center of the Vedado district, the center of Havana nightlife and home to the most important hotels such as the Melia Cohiba and the Riviera. Are available for the guests of this apartment: 2 double bedrooms each with its own bathroom and terrace, living room and a fully equipped kitchen. 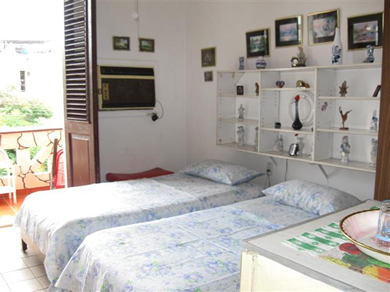 It is equipped with air conditioning, refrigerator, TV and CD player.The owner Mrs. Yenny is very nice and friendly and you can ask her any questions about your stay in Cuba.Daily cleaning, all utilities and local phone calls are included in the price. Excellent location in the center of the Vedado district, the center of Havana nightlife and home to the most important hotels such as the Melia Cohiba and the Riviera. Are available for the guests of this apartment: 2 double bedrooms, 1 bathroom, living room and a fully equipped kitchen. It is equipped with air conditioning, refrigerator, TV, DVD and CD. The owner Mrs. Iris is very nice and friendly and you can ask her any questions about your stay in Cuba.Daily cleaning, all utilities and local phone calls are included in the price. Meals are prepared at cheap prices upon request. Excellent location in the center of the Vedado district, the center of Havana nightlife and home to the most important hotels such as the Melia Cohiba and the Riviera. Are available for the guests of this apartment: 2 double bedrooms, 1 bathroom, living room and a fully equipped kitchen. It is equipped with air conditioning, refrigerator, TV, DVD and CD. 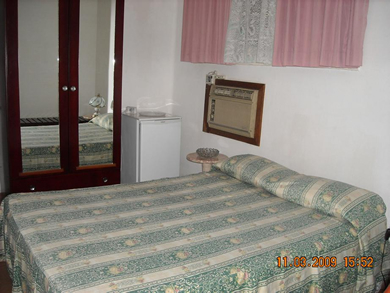 The owner Mrs. Mylena is very nice and friendly and you can ask her any questions about your stay in Cuba.Cleaning, change of sheets and towels three times a week, all utilities and local phone calls are included in the price. Breakfast and meals are offered at cheap prices on request. Excellent location in the center of the Vedado district, the center of Havana nightlife and home to the most important hotels such as the Melia Cohiba and the Riviera. Are available for the guests of this apartment: 3 double bedrooms, 3 bathrooms, living room, fully equipped kitchen, dining room and balcony. It is equipped with air conditioning, refrigerator and TV. The apartment is located on the ground floor and has an independent entrance. 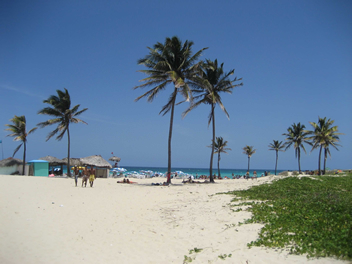 The owner Doctora Rad is very nice and friendly and you can ask her any questions about your stay in Cuba. Change of sheets and towels, daily cleaning, all utilities and local phone calls are included in the price. A bike rental service and the preparation of breakfast and meals are offered at cheap prices upon request.